For full details of what else you can expect when you come on board, give us a call. 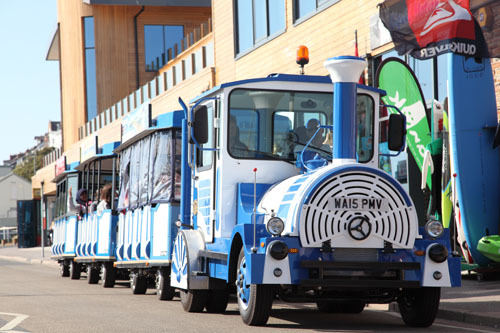 Our two land trains are purpose built vehicles under the model branding Tschu Tschu. Designed in Germany, the power to pull three carriages is supplied by an Isuzu engine which gets us up even the steepest hills. 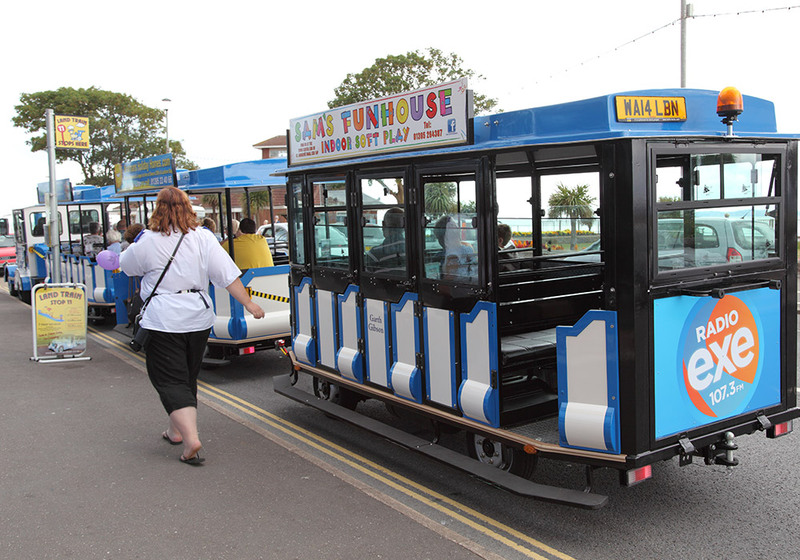 The carriages can carry up to 20 persons each and you have the choice of open, removable sides or fully enclosed. 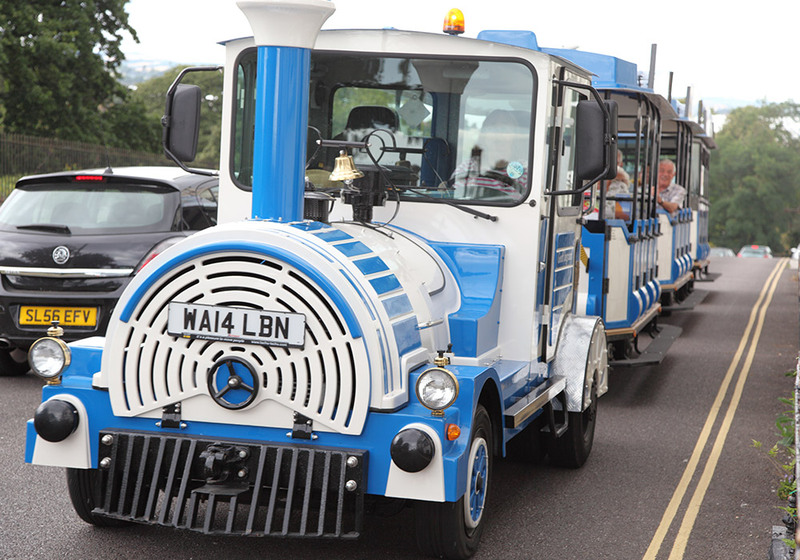 Exmouth residents voted to name the locomotive and carriages after popular figures in the town’s history. Details of each famous person can be found on the links about the train below. 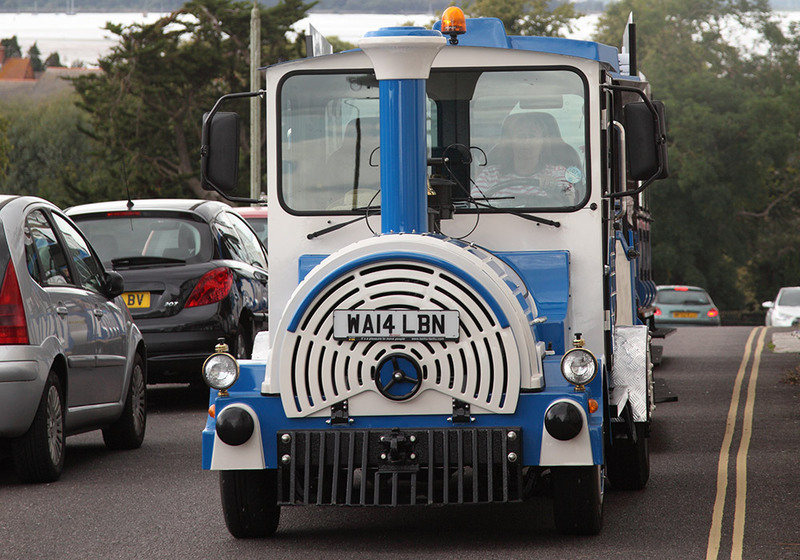 Our land trains are actually surprisingly manoeuvrable, able to turna round in the road and weave through the tightest of corners and spaces. This was our first Loco here at Exmouth Land Train. It has served us well with a range of private hire events and the full circuit. Skipper Geoff Ingram was a well-respected, professional and dependable seaman who helmed his fishing vessel the Sarah Jayne. He passed away at the age of 51 when his trawler capsized and sunk 2.5 miles from Berry Head in September 2012. His selfless act to instruct his crew to safety but return to the wheelhouse to launch a distress signal saved two lives but resulted in the loss of his own. Geoff was a former member of Exmouth RNLI and was awarded the Vellum Service Certificate for Bravery in 1985 after he saved two girls from their sinking speedboat in gale-force conditions. He was well known & loved throughout the community, particularly on Exmouth Docks, as a consummate and professional seaman. His name was put forward for the Exmouth Land Train by hundreds and it was with great pleasure that he was voted into this place of honour. This is a semi-enclosed carriage with roll-up banners on both sides of the carriage which offers protection from the wind and rain without disrupting the view. Brian Roswell dedicated 30 years of his life to Exmouth RNLI, including taking the roles of Second Coxswain and Coxswain. An admired and respected man, Brian Rowsell was awarded the Certificate of Vellum for the rescue of three bathers in heavy seas. He was also crew member during the tragic Christmas Day rescue in 1956 that saw the loss of Crewman Will Carder. Brian’s love of boats was in his blood. He built boats, helmed racing dinghies, worked as a pilot for Trinity House and was an accomplished fisherman. This complimented his three-decade dedication to the RNLI. Brian Rowsell’s name is part and parcel of Exmouth Docks and he was nominated by those who knew him. 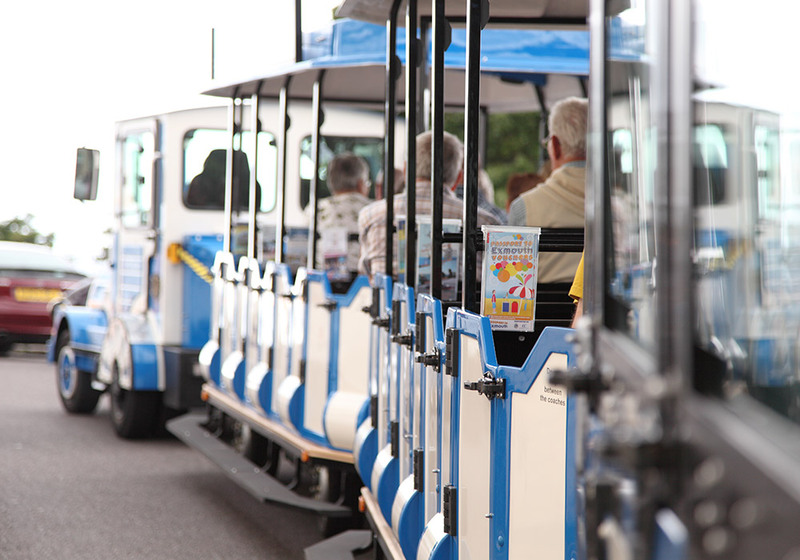 This is a completely open carriage and offers a unique way to experience the surrounding views as we travel along your route. Bill Sleeman was a historian and gentlemen’s outfitter who ingrained himself into Exmouth. Bill served as a Comodore of the Exe Sailing Club. He was also an RNLI crewman, a founder of the Exmouth Camera Club and the RAFA Club and, at the time of his passing, he was Chairman of the Exmouth Museum. Sleeman’s Outfitters on Exeter Road was one of Exmouth’s oldest businesses having been opened by Bill’s parents in 1907. The store built a reputation to be envied and Bill prided himself on serving customers who returned for 50 years or more! Bill collected every edition of the Exmouth Journal and was known as an unofficial historian for the town. Bill passed away in September 2009 and is remembered by many. A completely enclosed carriage with glass windows, this carriage offers the highest amount of protection on the coldest of days but also allows for the windows to be retracted downwards on the hottest of days to help keep you cool. Tregarthen Gibson was Exmouth’s colourful and gregarious Town Crier who passed away in May 2009. His booming voice could often be heard projecting over the Saturday morning crowds in the town centre and his larger-than-life presence placed him firmly in the hearts of residents and visitors alike. He was also a raucous member of the Exmouth Shanty Men. His chosen shanty name of ‘Rigger Mortiss’ guaranteed peals of laughter from the audience. Garth was a huge supporter of community groups and part of the tapestry of Exmouth and East Devon. He attended all Civic events ensuring laughter and joy spread through the town. Garth’s name was put forward for the Exmouth Land Train by his family and those who knew him best.